At VisionCare Consultants in SW St. Louis, we provide comprehensive eye exams, treatment of eye disease, specialty contact fittings, and designer eyeglasses for our patients. With our high tech – high touch approach, we have two simple goals – treat vision-related problems and advance the science of eye care. To achieve these goals, Vision Care Consultants centers its activities in three areas: Clinical Practice, Eye Research and Patient Education. The practice of Vision Care Consultants evolved out of the 40-year commitment of Dr. Rex Ghormley to his patients. He was later joined by Dr. David Seibel in 1987, Dr. Craig Brawley in 2001, Dr. Daniel Friederich in 2008 and Dr. Marie Wehner in 2010 to continue that same mission. These practitioners bring a newer approach to the practice of eye care called “Group Practice”. The strength of this concept is that the knowledge and expertise of different practitioners is brought together if needed to problem solve the patient’s complaint. 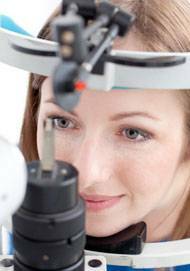 Patient education is one of the services we offer at each eye examination. Patients should expect that we diagnose and treat their medical eye condition, provide a source of information about their eye condition, while taking the time to answer all the patient’s questions. Vision Care Consultants has always been on the cutting edge of development and has researched many important new eye medications, contact lens designs, contact lens solutions, and eye care instrument technologies. Our patients comment that there is always something new at our office. Whether your prescription is for astigmatism, bifocals, or just a simple case of near or farsightedness, Vision Care Consultants can make the difference. This reputation of expert diagnostic ability, creative design, and quality eye care has drawn people from throughout the United States. We are dedicated to serve our patient’s eye care needs and to protect and preserve vision with a caring touch.